The Rescue Beauty Lounge Pre-Fall Collection is out now! At least for those who pre-ordered the polishes; they’ll be posted on the Rescue Beauty Lounge website for sale soon. I thought I wanted to wear Pizzicato first, but something about Poco a Poco grabbed me when I pulled it out of its little box, so that’s the first one I swatched. The L’Oiseau De Feu Collection is based on Ji Baek’s experiences watching Hurricane Earl in St. Barts. So it’s kind of funny that the collection “hit” when most of the Northeast was struggling through Hurricane Irene. L’Oiseau de Feu is a ballet by Igor Stravinsky, and Ji Baek was reminded of its rhythm and dynamic energy while watching the hurricane. Not being a musician or a huge ballet or classical music fan, I have to admit that this name doesn’t actually do much for me. But the colors are so pretty, and I appreciate the way they range from light and delicate to heavy and ominous. I picked up all four colors, and I’ll be posting swatches of the colors individually as I work through them. 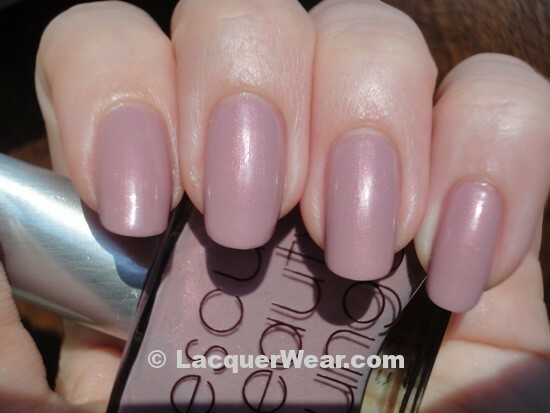 I picked Poco a Poco first, it’s a soft pink with grey/lavender undertones and a fine, coppery shimmer. The Rescue Beauty Lounge formula is thin and controllable. I only used two coats of Poco a Poco for the pictures below, but it seemed a bit less pigmented than most Rescue Beauty polishes, so after I was wearing it I wished I had used three coats instead of the usual two. On the nail it has a pretty, shadowy quality and pulls somehow a lot bluer than I expected from the bottle color. It really does make me think of soft, massing clouds. The coppery shimmer gives a warmer flash of color when it’s in direct light. This color is like a work color with a little something special – it’s office-appropriate and I’m sure most people wouldn’t notice it, but the name and the backstory give a little hint of cloudy, shimmery, sunlight anticipation to this color. It’s supposed to be the color before the storm. It’s a little something to imagine while you’re sitting at your desk. To give a better sense of the color I compared to Essie’s Lady Like from the Fall 2011 Collection, since they’re both dusty pinks with a slightly lavender look. Poco a Poco is on my index and middle fingers and Lady Like is on my ring and pinky fingers in the picture below. Lady Like is a cream, and has a darker, greyer/browner look. The shimmer in Poco a Poco makes it more lively, and the overall feel of the color is more delicate pink and softly tinted than Lady Like. Rescue Beauty polishes are only available for ordering through the Rescue Beauty website, now that the lounge has closed. The pre-orders are filled before the polishes go on general sale, but Ji Baek has posted that they’ll be up on the website for orders on 9/11.